While these are welcome improvements, Apple excludes users with older Macs and/or Nvidia graphics cards. There’s no sign Apple will ever extend eGPU support to Thunderbolt 1 and 2 Macs. Nvidia and Apple remain on unfriendly terms. Fortunately the developers of our community, Goalque, Mac_Editor, and Fr34k have continuously engineered workarounds to keep many Mac users in the game. Boot Camp mode to run Windows shows minor progress however. Does the release of Mojave mean your Mac is ready to adopt external graphics technology? Your particular configuration holds the answer. If you have a Thunderbolt 3 Mac computer, you’re in luck because this is the platform on which Apple has been building eGPU support. All you’d need is a MacOS-certified AMD Radeon graphics card + eGFX enclosure pairing that fits your needs and budget. There are a handful of solutions that come ready-to-go with a graphics card such as the Sonnet Breakaway Puck 570, Gigabyte RX 580 Gaming Box, and Blackmagic eGPU. As of fall 2018, these are Thunderbolt 3 Macs that have native eGPU support in MacOS 10.13.4 and newer. A more future-proof route is to piece together an eGPU yourself. This process takes more effort but gives you flexibility and upgradability. This is beneficial for both enthusiasts and first-timers. Enthusiasts get to have nearly full control of the features they want out of an eGPU. 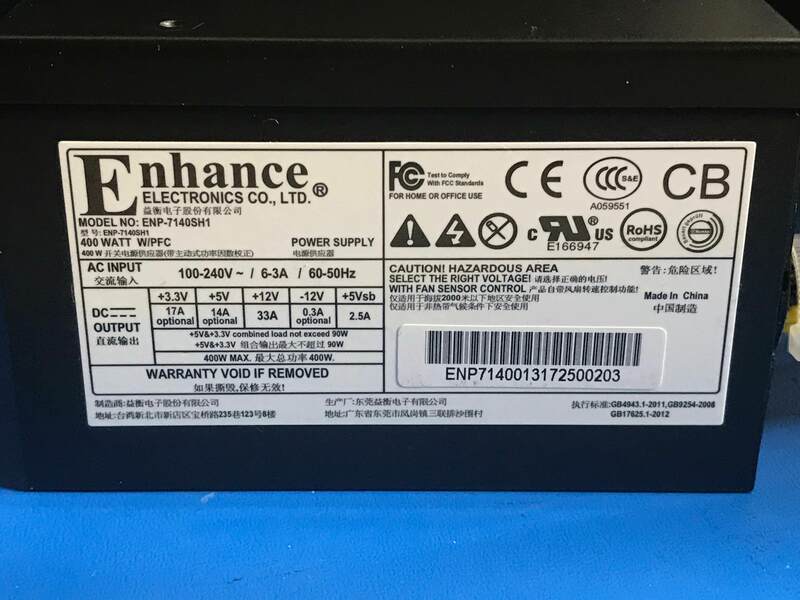 If you try eGPU out and decide it’s not what you expect, the GPU can be repurposed and the enclosure sold. Once you have the whole kit together, it’s plug-and-play with a Thunderbolt 3 Mac. Hot-plug and surprise removal of the external GPU has been working since 10.13.4. Occasionally the system may notify you it has to force-eject the eGPU. I’ve seen less of these notifications in Mojave 10.14. This macOS version also has much better support for multiple eGPUs. In High Sierra, there appeared to be a limited number of eGPU the system could handle based on the host computer’s Thunderbolt 3 controllers. macOS Mojave 10.14 raises this multiple eGPU support to four units. The most exciting feature is the ability to accelerate a Mac’s internal display with the eGPU. In previous macOS builds, the external GPU could only provide acceleration to OpenGL tasks rendered through an external monitor. There’s now a checkbox to set the eGPU as the preferred graphics card for all tasks in 10.14 regardless of whether an external monitor is attached. This mode forces eGPU loopback to the internal display of a MacBook Pro or iMac. In my opinion, an eGPU pane inside System Preferences would be a better tool. What’s the status of native eGPU support in macOS for Nvidia graphics cards? What about those of us with older Macs that are not Thunderbolt 3? Apple’s support is dead in the water. As a long-time Mac user and owner of a 2013 Mac Pro trashcan and 2015 15″ MacBook Pro, I’m disappointed by this. So are thousands of others in the same situation. Our community has been relentlessly providing unofficial eGPU support for these Macs Apple deemed unworthy. The main developers are Goalque, Mac_Editor, and Fr34k. Without their selfless contributions eGPU for Macs would not be as popular as it is today. EFI automate-eGPU solution by Goalque is a cleaner approach in that all patches happen on the fly during macOS booting process. The software can be installed on an external boot volume such as a USB thumb drive or a small partition of your Mac’s internal hard drive. The former is strongly encouraged so that there’s no risk of corrupting your drive and losing data. Using an external drive for each boot is not convenient, but it’s well worth the effort if you’re not willing to disable SIP and modify system files for eGPU support. Many Mac users who are interested in eGPU want to use it for gaming in Windows. We were hoping eGPU improvement in macOS Mojave 10.14 would also mean better support for Boot Camp mode. The reality is that Apple still considers eGPU use in Windows a non-priority. We had seen beta builds of macOS Mojave 10.14 directly affect the way eGPU worked in Boot Camp. Unfortunately there’s no one clear solution. It’s easier to set up an eGPU with Boot Camp in iGPU only Mac computers; dGPU-equipped Macs such as the 15″ MacBook Pro pose a challenge. 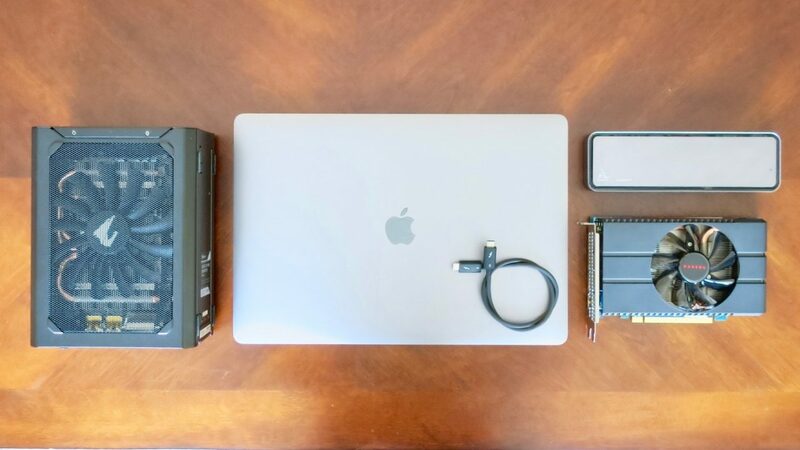 My Boot Camp eGPU setup guide provides more technical information and the step-by-step process for Thunderbolt 3 MacBook Pro users. While both AMD and Nvidia have made great strides in eGPU support for Windows, Apple does not adhere to the ways Windows computers interact with Thunderbolt 3 eGPUs. I’ve been testing the 2018 15″ MacBook Pro. The Mac firmware and Apple T2 chip are big hurdles to successfully set up an external GPU in Boot Camp. The only saving grace is that it has Large Memory allocation to help with error 12 when adding an Nvidia eGPU. As seen in the screen capture, adding an AMD eGPU in Boot Camp can wreak serious havoc to the system. Both the Radeon Pro 555X dGPU and RX 580 eGPU got yellow-banged with driver conflict and lack of resource issues. Microsoft has done Apple a huge favor with Windows 10 Spring Update. Version 1803 introduced Windows Hybrid Graphics that allows the external GPU to work with a discrete GPU for internal display acceleration. This is beneficial for Mac computers because Apple firmware has a tendency to disable the Intel-integrated GPU in favor of the AMD Radeon discrete GPU. Without an active iGPU, AMD XConnect and Nvidia Optimus can’t leverage eGPU acceleration to the internal display. As seen in the Graphics Settings of Windows, you can set your preference for a given software or game to use the higher-performing external graphics card. Mojave 10.14 has shown positive progress for eGPU Mac users. Hot-plug capability, internal display acceleration, and multiple eGPU support can truly transform an ultra-portable MacBook Pro into a powerful workstation. Our community remains committed to providing eGPU support for Nvidia and older Thunderbolt Mac users. We’re also hopeful Apple will improve its Mac firmware to make eGPU in Boot Camp a more straightforward process.